Suitable for vegans & vegetarians. 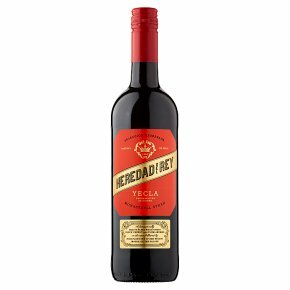 A fantastically smooth blend which offers black cherry and plum aromas on the nose followed by rich flavours of red fruits and mocha on the palate "Heredad Del Rey is an intense blend of Monastrell and Syrah varietals offering exciting aromas of black fruit and cinnamon. Aged 12 months in oak barrel, it has developed a smooth texture rich in plum and morello cherry flavours with a touch of black pepper on the finish. A medium bodied wine, Heredad Del Rey Monastrell-Syrah goes fantastically well with paella, spicy tapas and mature cheddar".